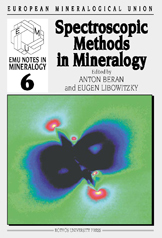 The present volume of the EMU Notes in Mineralogy is dedicated to different spectroscopic methods frequently applied in mineralogy and contains the contributions of the lectures given at the 6th School of the European Mineralogical Union (6th EMU School) on Spectroscopic Methods in Mineralogy, held at the University of Vienna from August 30 to September 8, 2004. The School includes the 5th European Conference on Mineralogy and Spectroscopy (ECMS 2004), held from September 4 to 8, 2004, where students will be provided with additional examples of state-of-the-art applications of spectroscopic methods. Spectroscopic methods provide information about the local structure of minerals. The methods do not depend on long-range periodicity or crystallinity. The geometric arrangement of atoms in a mineral phase is only one aspect of its constitution. Its vibrational characteristic, electronic structure and magnetic properties are of greatest importance when we consider the behaviour of minerals in dynamic processes. The characterisation of the structural and physico-chemical properties of a mineral requires the application of several complementary spectroscopic techniques. However, it is one of the main aims of this School to demonstrate that different spectroscopic methods work on the same basic principles. Spectroscopic techniques represent an extremely rapidly evolving area of mineralogy and many recent research efforts are similar to those in materials science, solid state physics and chemistry. Applications to different materials of geoscientific relevance have expanded by the development of microspectroscopic techniques and by in situ measurements at low- to high-temperature and high-pressure conditions. It is our hope that the present volume will contribute to the specific development of spectroscopic methods in geosciences and that it will stimulate numerous scientists who are concerned with detailed structural investigations of solid state materials with respect to their physical and chemical properties. i-xiv + 662 pages. ISBN 963 463 6624.